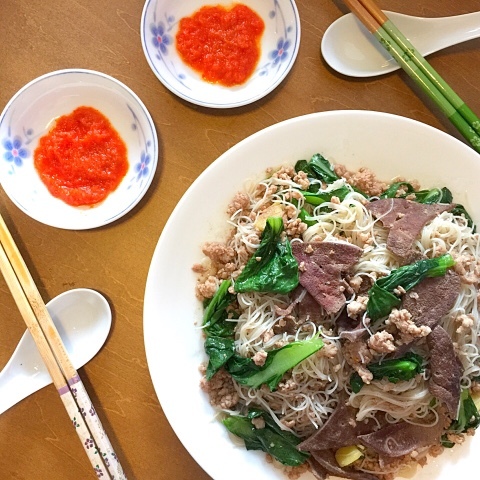 How to cook fried minced pork and liver bee hoon? 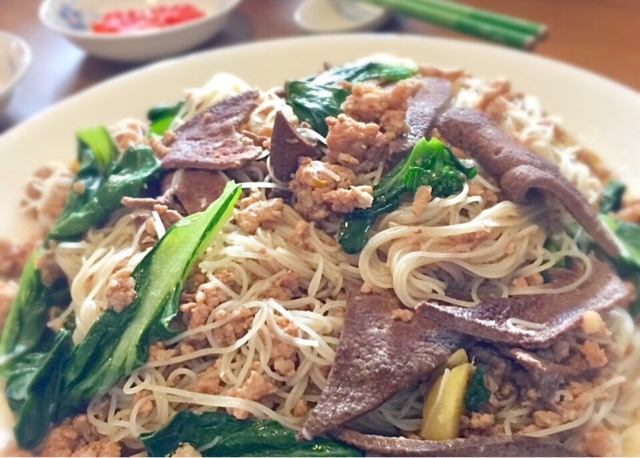 For pork liver lovers, you must try this - bee hoon infused with the natural sweetness of liver and pork! Today is Saturday which means I have the space to indulge in my hobby - cooking. Remember I told you that the TCM says that I feel tired easily because I do not have enough blood and energy. So, I decided to cook a liver dish. I love it very much and I want to share it with you. I went to Dong Li Huo Che (this pork seller always ties his hair in a pony tail with his lean muscles flexed while chopping pork and he reminds me of this rock band member) to buy 100 g of liver and 200 g of minced pork. He helped me to slice the liver with a machine upon request. Heng ah! No need to cut bloody liver myself. I marinated the minced pork and liver with soya sauce and pepper for 15 minutes in the clear plastic bag provided by Dong Li Huo Che man so that I do not need to touch the bloody liver and yet can massage the bag to ensure a thorough marination. I used Chilli brand bee hoon and soak it in water. Remove it from water the moment it loses its transparency. Don't soak too long. The bee hoon needs to absorb the gravy during cooking. If you soak too long, it will break into pieces. I always use olive oil meant for stir frying. Once hot, I added in the sliced and bruised ginger. I fried it until there is a ginger fragrance and added in sesame oil. An aroma will fill the kitchen immediately upon this step. I added in the marinated pork and liver. Next, I added abalone sauce (can be purchased from any NTUC). It was time to give it a good fry. It is important to add water to cover the meat while the meat is still half cooked half pink. The gravy would contain the strong flavours of liver. Then I added in the hard bee hoon and gave it another good fry. It is important to remove the liver now to avoid being overcooked. If I add the liver later, the gravy would miss out having the unique flavours of liver. Now, I had to taste. If it is too bland, I could still add more abalone sauce. Lastly, I added in the Cai Xin. Let the bee hoon absorb the gravy for a while. When the bee hoon and meat were cooked and ready, there should still be gravy left. Don't panic. 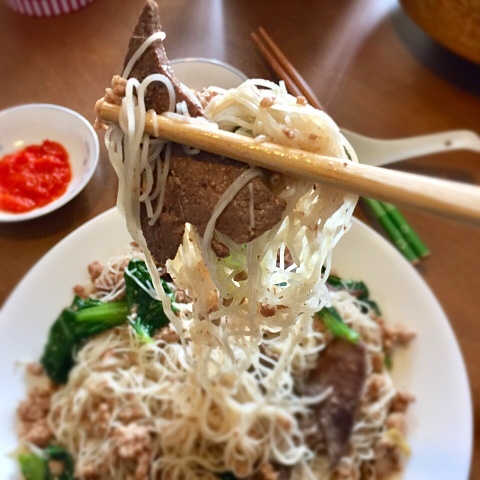 By the time you serve, the bee hoon would have absorbed every last bit of it and it would taste yummilicious. The result of this would be soft bee hoon infused with delicious flavours and yet not broken into pieces. If you fry until there is no gravy left, by the time you serve, the bee hoon might be too dry. Under my new TCM physician advice to load more iron and herbal soups, I also have a surprising reward. My hair grew thicker! That is why I am motivated to follow her health tips. Ha Ha.